Is there such a thing as "too much brioche"? I'm not really sure there is so let's dive in to another brioche pattern that I'm so happy to share with you. Originally released as a "learn to brioche" MKAL, this wonderful hat that is ALL brioche ALL the time has made many a knitter proud with their new brioche skills. Some days I get to ham it up for the camera and this particular day was no exception. I was so excited about this hat I couldn't not pose like an 80's band member. 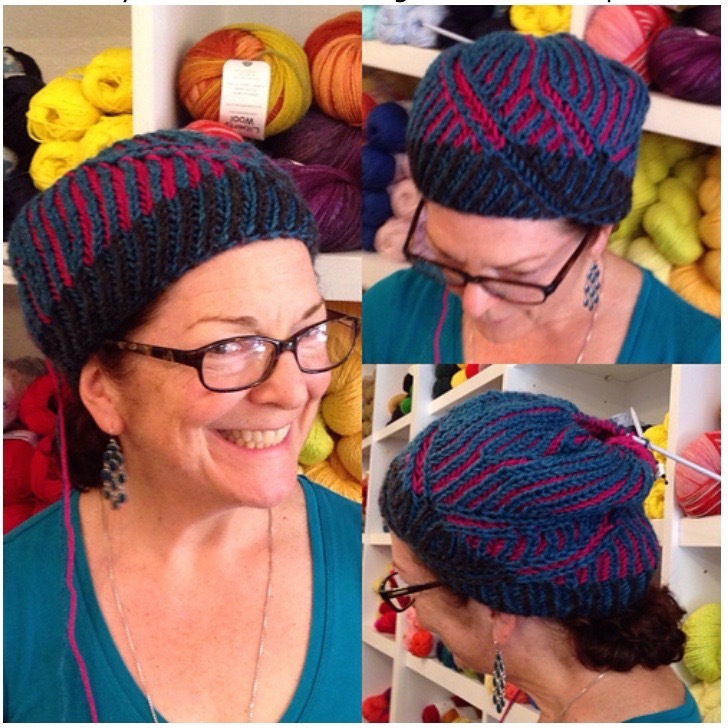 This fun-to-knit project uses 3 skeins, one of each color in Ewe Ewe Yarns Wooly Worsted. I highly recommend Ewe Ewe for your brioche projects, especially if you're a newbie brioche-er, because it can take a ripping or two and still look fabulous. You will use ALL of the Color B (the aqua in the above photos) so when you swatch, do so with Color A (the tan color in the above photos). This hat is constructed in the round, from the brim up. A two-color cable cast-on is used to begin the hat and then is worked in brioche up through the grown of the hat. What'cha waiting for? Go grab your needles and have some brioche fun! Find the pattern here on my website or on Ravelry!